I remember watching this cartoon in the 4th grade. I had to finish my homework before 5:30 when it came on. Every episode back in the days, they either sang a song at the end of the cartoon or showed the Brown Hornet or Legal Eagle at the beginning of the cartoon. It took them 100 years to bring Fat Albert back. 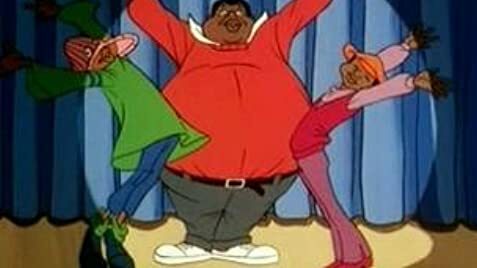 And they just started selling DVDs of SOME Fat Albert episodes. There are still some episodes that I have never seen and some episodes that I haven't seen in 21 years! The movie was nothing like the cartoon. No bickering between Rudy and Russell that we saw every episode of the cartoon. And if anyone saw the movie before seeing the cartoon, they are like school at midnight, "NO CLASS!" The characters are based on Bill Cosby and his childhood friends growing up in North Philadelphia. Cosby talked about his childhood experiences in his stand-up comedy albums. Television Announcer: It's not a bird! It's not a bee! It's the BROWN HORNEEEEEEEEEEETTT! In episode #4, "Creativity", Rudy's voice comes out of Bill ("what 'choo talkin' about?") with Rudy even standing right next to Bill.